Insomniac Events is the master of Halloween. You of course know them for Electric Daisy Carnival and a handful of other dance music festivals featuring some of the best production in the world. 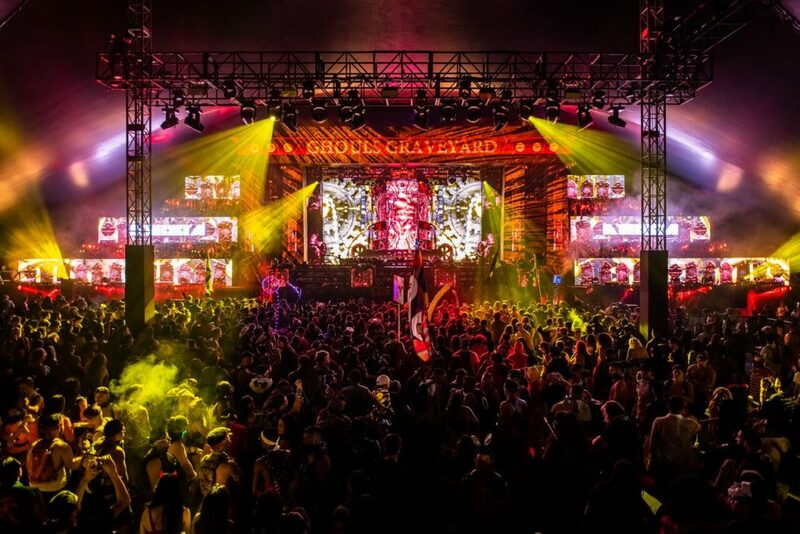 Their Escape: Psycho Circus event is no exception, with four themed stages, a pop-up ‘psycho’ circus, roaming costumed performers, and over 70 artists providing a soundtrack to the largest Halloween dance music gathering in North America. And most importantly, tucked away in a nearly hidden area of the festival grounds is the best haunted house we’ve ever experienced. 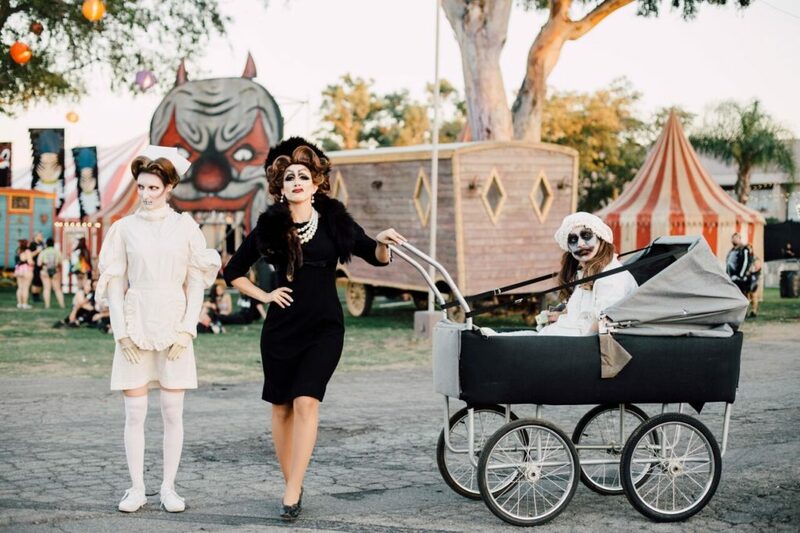 The eighth annual Escape: Psycho Circus took place Oct. 27 and 28 at the NOS Event Center in San Bernadino, Calif., hosting a sold-out crowd of more than 60,000 attendees per day. 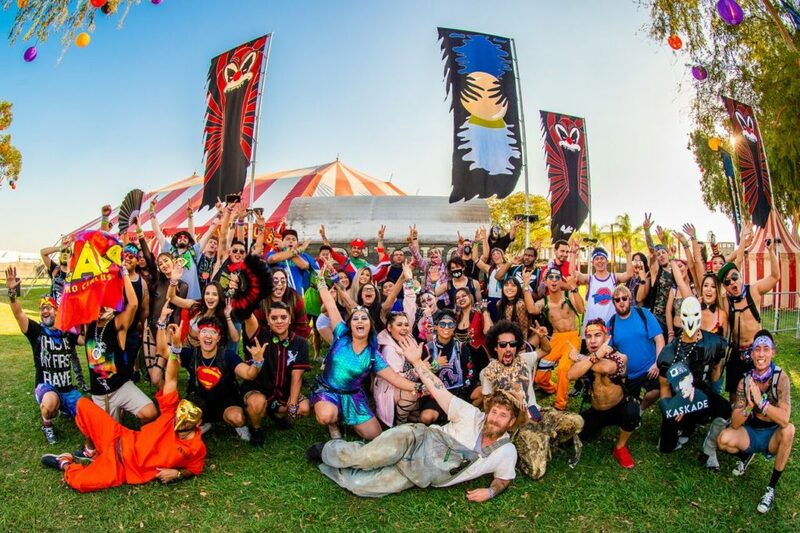 Insomniac and its followers are no stranger to the NOS Event Center as it hosts almost all of their large-scale events in Southern California. It’s an hour drive from LAX (assuming no traffic) and conveniently located right off the freeway with plenty of hotels nearby — even if you have to find one 30 minutes away to save some cash. Four tented stages were constructed throughout the grounds, each with a different theme and musical style: the Slaughterhouse, Ghoul’s Graveyard, Chopping Block, and Cannibals’ Tea Party. A small pond served as a reflection pool to the thousands of illuminated paper lanterns scattered throughout the trees. Parking lots are sprinkled throughout the perimeter of the festival grounds and one lot was setup specifically for Uber pick-ups. 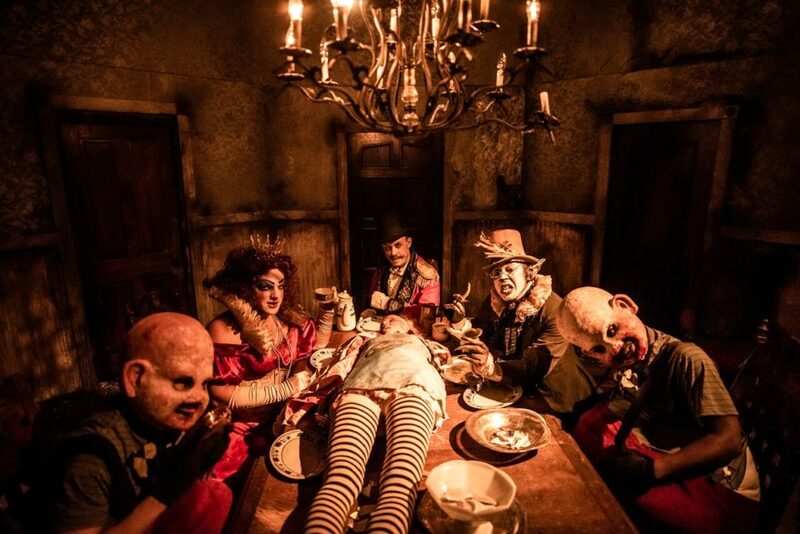 Aside from the more obvious reasons, Escape’s ‘Asylum’ haunted maze makes the journey to Southern California worth it. 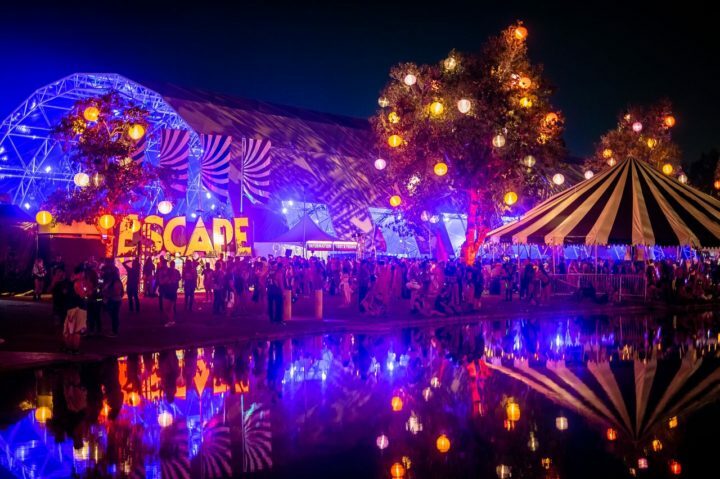 The storyline for the maze is based off eight years of Escape trailers, and includes familiar characters from Alice in Wonderland (Escape was originally named ‘Escape from Wonderland’ to tie in with Insomniac’s other ‘Wonderland’ festival brands). The Asylum itself is designed as a nightmare-inducing psychiatric ward and is by far the most immersive Halloween attraction we’ve ever encountered. We were then ushered to a holding area where we were all fitted with straightjackets and masks. This may be a terrifying thought to some, but adding this element of participation elevates the experience above any other Halloween attraction we’ve ever seen. Nurses administered “medication” (a la Smarties) before we were sent into a dark padded room with a disturbed clown, which served as the start of a wild journey through 30 distinct rooms featuring 150 performers and 25 unique sound systems. What happened next is a bit of a blur and almost impossible to describe. Left to our own exploring, our group of 10 wandered unaccompanied through the nearly never-ending 32,000-square-foot maze, actively searching for room exits that led to the next startling surprise. Before we reached the end, a video recording of the doctor we first saw in the ward’s entrance told us “you are feeling better now.” Staff removed our straightjackets and we were ushered out to an alleyway which featured a few more performers and the entrance to a “secret” speakeasy bar disguised as a noodle shop storefront. Each stage was intricately themed and aptly named for the holiday. At the Slaughterhouse stage, the DJ booth was inside a clown’s mouth and featured over 730 video tiles, 450 lights, and 16 lasers. Costumed performers of all types danced on the stage while acrobats performed trampoline tricks on the sides. Performing artists included Martin Garrix, Diplo, Galantis, Seven Lions, and Kaskade. The Slaughterhouse stage also featured an impressive VIP area with a Jumanji theme. The entryway featured an extensive jungle scene with an LED floor depicting running water (which can be somewhat disorienting). Amenities inside the VIP lounge included food trucks, kandi-making stations, trick-or-treat snacks, coffee and hot chocolate, photo booths, a beauty bar, hookah lounge, and more. 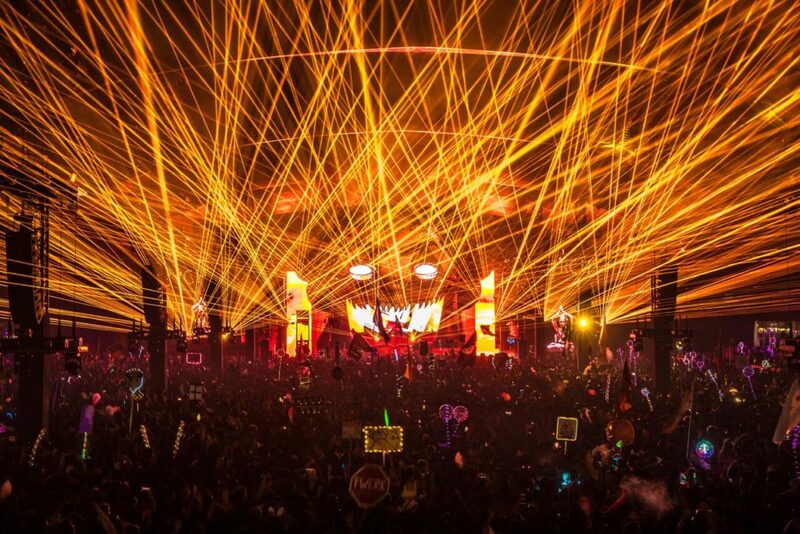 Ghoul’s Graveyard featured 326 lights and 26 lasers, and was home to a Bassrush takeover on Friday night. Artists included Joyryde, GTA, Excision, Tchami x Malaa, and Eric Prydz. The Chopping Block was home to a Basscon hardstyle takeover on Friday night and an Audiotistic takeover on Saturday night. Artists included Brennan Heart, Digital Punk, Angerfist, SayMyName, A-Trak, Snakehips, and more. The Cannibals’ Tea Party stage — where you were most likely to find us dancing all weekend — had a minimal warehouse feel with a dark DJ booth and mesmerizing lighting effects, plus Factory 93’s iconic diamond-shaped disco ball. Artists included Jamie Jones, Claude Vonstroke, Dubfire, and a personal favorite: Green Velvet. This is the first time the Cannibals’ Tea Party stage has been under a tent instead of inside one of the permanent onsite buildings, but the effect was the same — now with much-needed air flow! Aside from the stages, a circus and freak show area was located near the festival’s entrance. The ‘Psycho Circus’ included tents with burlesque performances, magicians, fortunetellers, and contortionists, in addition to a carousel and seating areas. Also near the entrance was a crashed UFO art installation, a promotion for Insomniac’s alien-themed Countdown NYE festival on Dec. 31. It’s common for fans to wear creative outfits at festivals, but roaming around with almost everyone in some sort of costume made the experience all the better. Some of the costumes were so good, it was tough to distinguish if they were attendees or actually paid performers. Southern California festivals are always a treat to attend. There’s a certain energy in the air that’s tough to describe and the friendliness of the crowd inside the festival gates is a welcomed change of pace. SoCal is where I first discovered the dance music event scene, and Escape directly inspired the creation of this website seven years ago. So, for me, a trip to Escape is as much the anniversary of a life-changing moment as it is a celebration of one of my favorite holidays. For dance music and Halloween fans, Escape: Psycho Circus is hands-down the best Halloween celebration one can find. In addition to hosting some of the top artists in electronic music, the onsite Asylum haunted maze is astoundingly well done. Next year, skip Hollywood Horror Nights and plan a trip to Escape instead. All photos courtesy Insomniac Events.